The big tech showdown that is IFA 2013 may not kick off until later this week but Acer's staying ahead of the fray with its computing announcements, unveiling a desktop Android touch-enabled all-in-one. 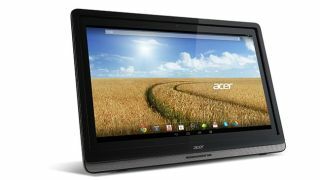 The snappily named Acer DA241HL comes with Android 4.2 (Jelly Bean), a quad-core Tegra 3 processor and a 24-inch touchscreen, but it's an all-in-one PC rather than a massive tablet. The reason being, Acer says, is it wants you to enjoy that warm sense of familiarity when you fire up your home PC as you do on your Android phone and Android tablet. The company says its the first all-in-one to come running Android (although there have been dual-boot models in the past), giving you full access to Google Play. There's also MHL connectivity and the ability to act as a touch display for Windows 8 PCs via HDMI or USB connection. The Acer DA231HL will be available in October, with prices starting at €429 (around £364 / US$567 / AU$630). There are a few more all-in-ones breaking out of the Acer stable today as well: the 23-inch FUll HD Aspire U5-610 rocks 4th gen Intel Core CPUs, Nvidia GeForce GTX760M graphics power and up to 16GB DDR3 memory. Lands in December from €1,129 (£960 / US$1492 / AU$1660). If AMD is more your bag, the Aspire Z3-105 should scratch that itch with A series quad-core processors and Radeon graphics on board the 23-inch full HD IPS touch display and audio smarts courtesy of Harman Kardon and Dolby Home Theatre v4. The 105 hits in December with prices starting from €799 (£680 / US$1056 / AU$1177). A heady mix of the two, the Aspire Z3-610 features the 105's audio beef as well as the 610's Intel processing power behind a 23-inch touch display. Yours from January from €799. Finally, if you're after a 27-inch WQHD touch display then Acer has also got you covered with the T272HUL - an edge-to-edge panel with webcam, integrated mic and 2560 x 1440 resolution. There's a September release date on the cards, with pricing set at €799.